Category: Hardware, Language: E, cover: HC, pages: 0, year: 2007. 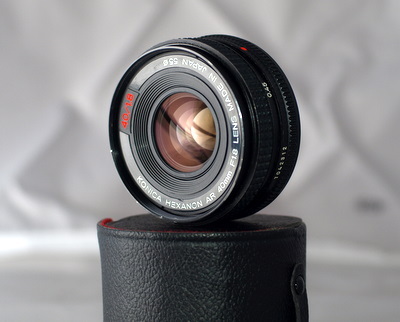 How to convert a Konica Hexanon AR 40mm F1.8 lens to FourThirds mount (Olympus, Panasonic etc). [The above title photo shows the] Hexanon 40mm lens shot with my other Hexanon 40mm lens. You won't get autofocus and you always have to shoot in aperture priority mode (or manual). But no adapter is necessary and the lenses are cheap.